You are here: Home / Jewelry / Jade, ruby, onyx, and diamond elephant necklace by Michele della Valle. 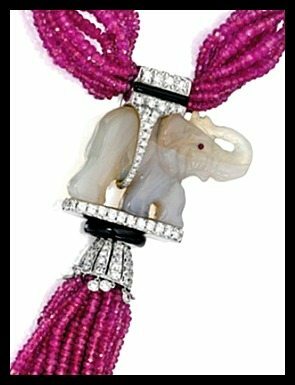 Jade, ruby, onyx, and diamond elephant necklace by Michele della Valle. This elephant-tastic necklace by Michele della Valle is perfectly delightful. Elephants have always been my favorite animal, which is part of why this ruby, onyx, jade, and diamond elephant necklace fills me with such glee. It’s a pretty major piece: we’re looking at 373.45 carats of ruby beads with 7.27 carats of diamonds and 11 carved jade elephants. I bet it’s wonderfully cool and reassuringly weighty. I especially love the diamond harness-style detail on the elephant at the top of the tassel and the tiny diamond fringes hanging at the top of the tassel itself. What do you think of this piece? Funky and fabulous, or a little too much for you? How would you style it? 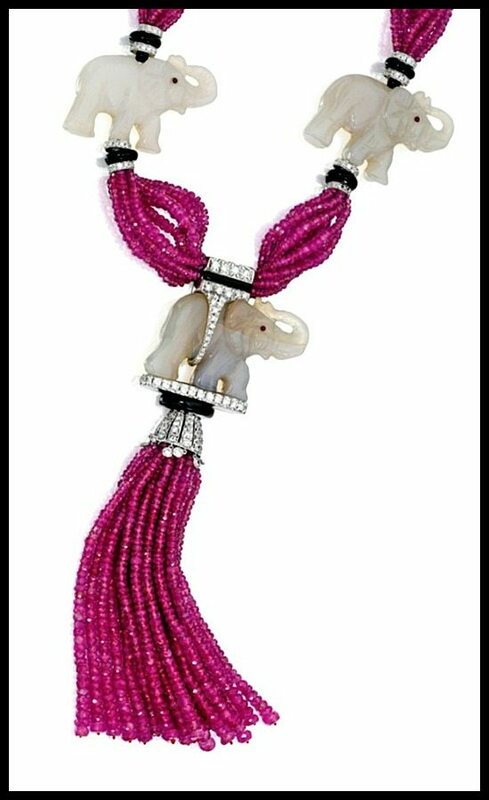 This fabulous ruby, onyx, jade, and diamond elephant necklace by Michele della Valle was listed in a recent Sotheby’s auction. All images and info are thanks to Sotheby’s.